Produced by Alan McGirvan and Vicki Bennett, screenplay by Vicki Bennett. ‘Young Digger’ was a war orphan who was adopted by an airman then smuggled to England in an oat sack, then in a wicker basket to Australia. The story of how a Victorian Aussie school boy worked hard to raise two pennies to help rebuild a destroyed school in Villers-Bretonneux, France. The glorious day we stole the last surviving A7V Sturmpanzerwagen tank from under the German’s noses and took it home as a trophy. This is the riveting tale of the ‘Mephisto’ and how he came to rest in Brisbane. The story of how Australia’s indigenous soldiers – initially banned from enlisting in WWI – came to rest at Villers-Bretonneux and eventually recognised for their part in Australia’s war effort. General John Monash contributed to the turning of the tide in WWI and lead to his on-field knighthood by King George V, the first such-dubbing in over 200 years. 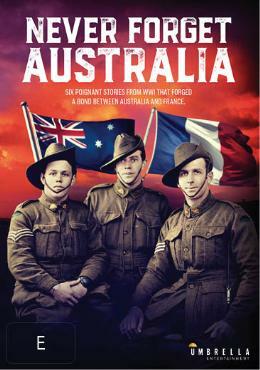 The story of the Unknown Soldier, one of those eleven thousand Anzac’s known only to God came home to Australia. This is the story of a little part of Australia that lies in the middle of France. The small French village of Villers-Bretonneux has the largest Australian war memorial in Europe, with the names of fifty-eight thousand Anzac soldiers that died in World War. Every Anzac Day is a public holiday here and it is filled with little Australian stories, known and unknown, powerful and poignant.